The action is in the first-person perspective, and unlike DOOM, you can look up and down for your enemies, all the better to locate and eliminate them. 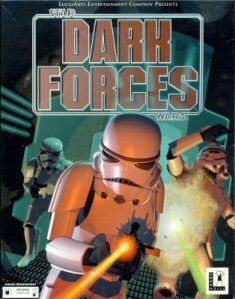 Although later in the game series Kyle hears the call of the Jedi, there’s no lightsaber action in this game. However, there are plenty of other weapons to keep you interested, including the Bryar pistol, the standard stormtrooper E-11 blaster rifle, thermal detonators, the absolutely awesome Stouker concussion rifle, and the Dark Trooper assault cannon (the best way to take those bad boys out).